Standing in line at the Home Depot, hand basket filled with paint thinner and sand paper, I realize that I may very well be insane, for I was gearing up to update an old, hand-made family dresser that I had previously– not once, but twice — tried to tackle. Would this third attempt at a creating a modern, fun and functional piece of home decor be my last? If history was any indicator, probably not. On attempt one, an unfortunate lapse of judgement in the paint department resulted in a dresser that could have been dreamt up by the Harlem Globetrotters. Exhausted, defeated, and in no hurry to continue my intimate relationship with the orbital sander and foam paint brush, I resolved to hastily fix the problem with fabric and a staple gun. Undoubtedly an improvement, but only a temporary fix to buy myself some time before once again taking up arms against the contrary cabinet. The fabric would have to come off, as well as the multiple layers of blue and yellow paint. But that wasn’t the whole of it. I would also remove the trim around the base and add some hairpin legs to really drive home that updated modern feel. The only thing that would stay was the hardware. Finally, finally I think I nailed it. Our DIY kitchen renovation is unquestionably the largest project we’ve undertaken since buying the house, but I can’t rightly call it finished. There remains one critical eye sore in the room as it stands—the flooring. It’s this very unpleasant tiling–beige with brown marbling–that is suppose to have the intended effect of camouflaging dirt. The unfortunate truth is it does the opposite. Even after a deep clean, the floor ALWAYS looks dirty. Mark my words, 2015 will be the year that we finally toss the dingy tiles in favor of something a little more fresh and fun. As I recently wrote, for our renovation projects, it is important that we make era-appropriate style choices for upgrading our space. But that leaves me with a lot of questions for what to do about the floors. My first instinct: classic linoleum. But picking the right shade and texture of flooring to match our eclectic and busy kitchen, would be a challenge. Enter the wonders of photoshop to help point me in the right direction. Right away, two clear winners stood out. Linoleum definitely fits in with the ’50’s scheme, but the more I thought about durability and style, the more I started to wonder about other contenders. I knew I was a fan of the darker grey color for the floor, but wondered if something a little more sleek would make sense. I am definitely a fan of the way the floor tiles sort of mirror the mosaic backplash, but one of the reasons I was drawn to linoleum in the first place was because I wanted to avoid having grout, if at all possible. The kitchen arguably gets more traffic than any other room in the house. And the fewer cracks and crevices in which dirt can collect, the better. Which led me to my final proposition: concrete. I’ve always loved concrete flooring, but had reservations about how that industrial look would fit in with a mid century vibe. While there is potential for it to clash, I’ve equal reason to believe the contrast could be a refreshing change. While it’s not an exact science, photoshop confirmed my suspicions. There could be some real potential in demolishing the existing tile and giving the concrete underneath some TLC. I’m a big fan of how the polished concrete reflects the light (which the small, one-window kitchen definitely needs) and how it would likely make for easy cleaning. What say you Internet? Am I grasping at straws or could there be something to this whole concrete idea? Does the industrial flooring complement or clash with the warm wooden cabinetry? I’m legitimately flummoxed. Buy a gallon of blue paint with which to makeover a room in House Doodle. While there is currently an empty box of Samoas (formerly Caramel DeLites, formerly Samoas) sitting in my recycling bin, I am writing today about Inevitable Life Event Number Three: Blue Re-Do! This time, the office would be the victim of The Doodle House Blues. It was, after all, the only room in the house that still boasted the same bland beige color chosen by the previous owners. Yes, a renovation was clearly in order. Our office gets a lot of use. A studious history teacher, Heath uses the space to prep (mentally and academically) for his lectures, and as a frequent work-from-home gal, I wanted a place where I would feel productive and comfortable. There were two inspiration rooms that I chose to emulate for our new work space. Heath has always longed for a stately, near presidential, library in which to pour over his history texts, while I tend to prefer a more eclectic atmosphere. I liked that both of these spaces found a way to mix textures, color and patterns to create areas that feel both formal and welcoming. Common elements were the vintage oriental rugs, tufted seating, dark wall colors and minimalist desks. We could work with that. In an attempt to create a home library, also on the wish list for the new space was a wall of books. Inspired by a bracketed bookshelf some of our pals recently installed in their new rental, we figured we could try something similar in our home office. We are both pretty pleased with how things turned out. I’d still like to switch out the ’70s ceiling fan at some point, but all-in-all we’re both head over heels for the new space. Working from home has never been more enjoyable. Over the weekend, I was *THRILLED* to find that Apartment Therapy featured our DIY kitchen renovation on their blog. I have never hidden the fact that AT is a huge inspirational blog for me, so it was really humbling to see our kitchen featured on their site. One thing that surprised me, however, was many of the comments. Namely, many people were surprised (some pleasantly, some not so) to see I kept the knotty pine cabinets rather than paint over them. I can’t say I blame those curious commentors. 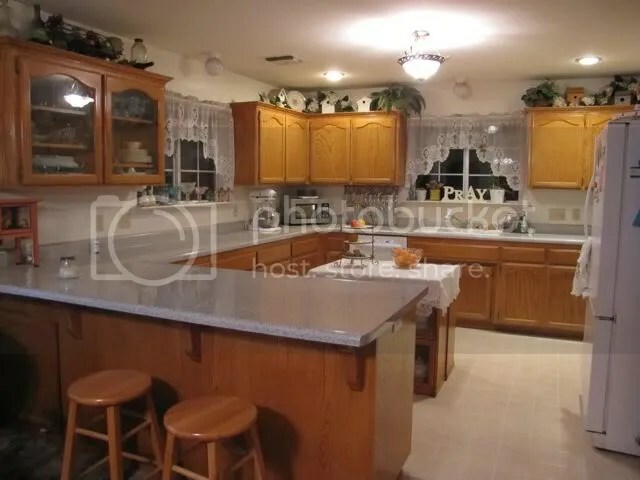 In fact, when we first purchased our new house, I even wrote a blog entitled “Naughty Pine” all about how much I hate how knotty pine cabinets look. They were, I reckoned, dated and dark and dirty. The fact that I decided to keep them surprised me as much as anyone else. So, why did I do it? 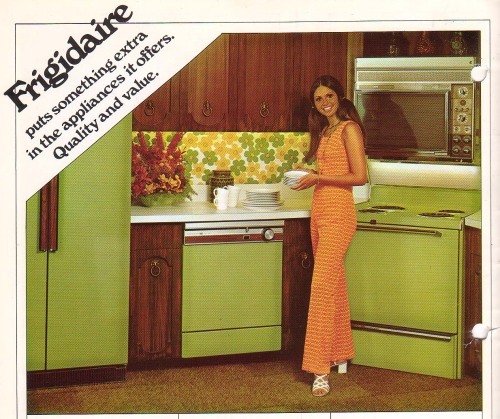 For one, we didn’t have it in our budget to rebuild the cabinets or change the general layout of the kitchen. That certainly plays a significant role. So rather than try and completely modernize the kitchen, I decided to embrace the era in which the house was built–1957–but still give the kitchen some life and updated style. It’s why we bought a Big Chill fridge (my most prized possession) and opted to keep the classic, mid-century cabinets in their knotty pine glory while still bringing in a shiny and new countertop and back splash. 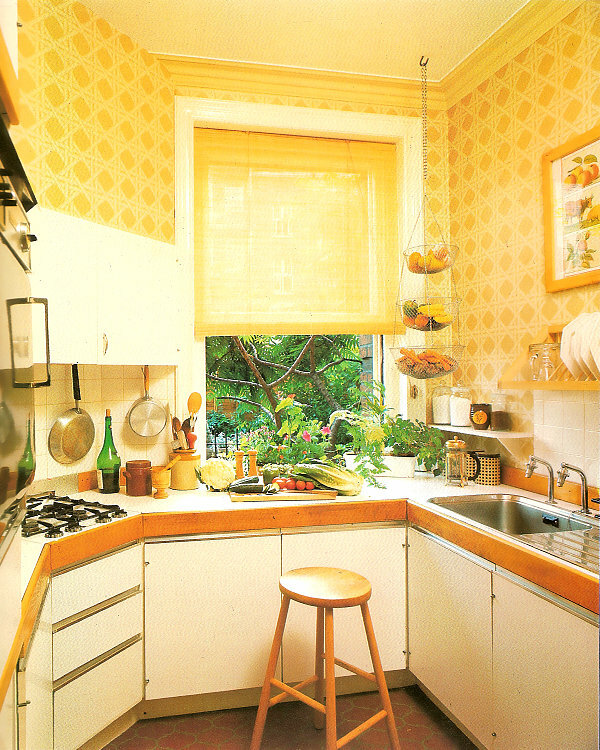 At the end of the day, a 2012 kitchen in a 1957 home didn’t seem like the best fit. There are a handful of other blogs that reinforce this ideology. Retro Renovation, is one that very intentionally focuses on preserving the original integrity of older homes, and which has been a valuable resource for me. Check out some of their time capsule homes. 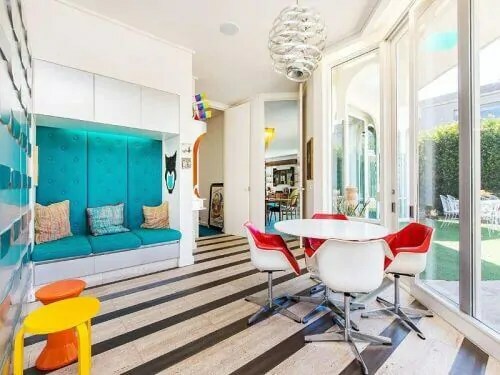 Another local blogger (and amazing photographer) that understands the importance of balancing history with modernity is Heather Banks of Brady Bunch Remodel fame. At the heart of it, what I’m trying to say is this: old homes have their charms and their flaws. And while it’s certainly tempting to demolish and reconstruct your home (if you have the means) to a more modern and magnificent space, there’s also something to be said for preservation. And I hope other caretakers of homes of other eras will find ways to enhance AND embrace the features that make those spaces a part of their city’s history. REDEMPTION! A dresser “recovers” from a botched paint job. A few weeks ago I wrote about the tragic saga of the dresser that turned into a chicken. Today, I’m happy to report that the dresser makeover that went horribly wrong has been corrected! Or, at least it’s slightly less repulsive? To jog your memory, our story began with a completely adequate dresser that I destroyed when I forgot what the color “gold” looks like. The result was more eeek than chic and whatever my next move was, I knew I wanted to retain a geometric pattern because, well, it’s simply the best. But I also knew I couldn’t be trusted with paint again. Nor was I especially eager to repaint what took several painstaking hours to achieve. My solution? Cover the drawers in a large-scale geometric fabric print. Much like these crafty Design Sponge artisans did. An afternoon trip to local upholstery shop Spruce got me just what I needed. After looking at a handful of fabric samples and even wallpaper swatches, I ended up walking out some clearance fabric for $20 that was just barely perfect amount to cover the front of the drawers. No paint or sander was needed. Armed with just a staple gun and a pair of scissors, in 30 minutes I was able to save the dresser from the DIY disaster hall of fame. I’m not sure this is going to be my permanent solution for glamifying the dresser, but at least the fabric do-over is a vast improvement from where we started, and it didn’t require an obscene amount of effort or money to achieve. Let’s upgrade this project from a D-I-Why did I do this? to a D-I-Why, it could have been worse. I’m going to interrupt your regularly scheduled international blog series to focus on some domestic affairs: my living room. …and it really got me thinking about how much I love the contrast of an oriental rug paired with sleek modern design. It’s totally in step with the whole “modern eclectic” vibe I’m going for. So, immediately I went in search of more inspiration to satiate my appetite. The internets did not disappoint. Designers seem to be loving the whole modern-meets-traditional vibe that this pairing provides. Clearly its not a new concept, but nevertheless, it struck a chord with me. And, as his holiness The Dude professed unto his disciples, the power to tie a room together belongs to that of the truly great rug. Naturally, I went out in search of one of my own. A couple of tryout rugs later (thanks to Kaskas very convenient try-before-you-buy policy) I ended up with a winner, and it led to a complete transformation of our living room. I can’t side step that one big reason for the living room transformation lies not only with the rug but also with the change in wall color. The new rug is definitely an accent piece and as such, demands a lot of attention. Attention that my beloved stencil wall could not compete with. While it was with a bit of a heavy heart that I painted over the old Stecie, I remain convinced it was the right call. One can only take so much attention-seeking behavior in one room. (Though I will say, the wall does demand some kind of artistic treatment beyond plane white. I’ve just yet to determine what will be the best fit for this new style.) Along with the stencil wall, I also big adieu to the green accent wall. That wall too felt a little funny painting over. I remember coming in the night we closed on the house to get it painted up before we moved in. How interesting to discover how my styles and preferences have shifted over these 3 years. But I’ve not regretted making the change away from our vibrant walls. I loved our little green room while we had it, and as I loved that, I’m also loving this next design progression.